Concrete Polishing & Staining Conference and Expo (CP&S) brings together vendors, concrete contractors and related professionals involved in concrete polishing. The event features an all-day Leadership Boot Camp for any leader in the construction industry, a three-day conference with technical and management sessions, and an exhibit hall with industry-leading vendors from throughout the industry. CP&S features vendors from throughout the industry. Companies considering expansion into this highly profitable segment of the industry will find a wealth of resources all under one roof. 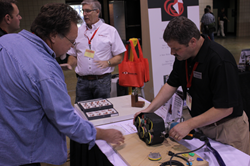 “This is NOT your parents’ concrete,” stresses Ryan Olson, show manager for the Concrete Polishing & Staining Conference and Expo (CP&S), which will be Oct. 20-22 at the Wisconsin Center in Milwaukee. Polished and stained concrete is showing up everywhere! This burgeoning segment of the concrete industry is evident inside and outside homes, in downtowns, at commercial locations, in schools and other public and private buildings. CP&S kicks off October 19 with an all-day Leadership Boot Camp for anyone in the construction industry. This intensive leadership training program is led by Brad Humphrey of Pinnacle Development Group. Humphrey is one of the most successful leadership training professionals in the construction industry, having helped thousands of construction owners and leaders improve and fine-tune their leadership skills over the past 10 years. The three-day conference, which runs Oct. 20-22, features 20 educational sessions presenting technical and management courses from Surface Preparation to Marketing Your Business and Upselling Your Services. The exhibit hall, which will be open Oct. 20 and 21, features vendors from throughout the industry. CP&S is presented by Concrete Contractor and Polishing Contractor magazines, along with the other AC Business Media Construction Network brands. CP&S sponsors include Substrate Technology, Inc., Solomon Colors, L.M. Scofield Company, Runyon Surface Prep Rental & Supply, and Wacker Neuson. For details and registration, visit http://www.CPSconference.com. AC Business Media, the parent company of Concrete Polishing & Staining Conference and Expo, is a business-to-business media company with a portfolio of renowned brands in heavy construction, asphalt, concrete, paving, rental, sustainability, manufacturing, logistics and supply chain markets. AC Business Media delivers relevant, cutting-edge content to its audiences through its industry-leading digital properties, trade shows, videos, magazines, webinars and newsletters and provides advertisers the analytics, data and ability to reach their target audience. For more information, visit http://www.ACBusinessMedia.com.